The Sharp EL-8 was one of the first hand-held calculators. Sharp also put the same electronics into different cases to produce calculators for sale by Facit and Addo. Display is 8 digits green "Itron" fluorescent tubes. 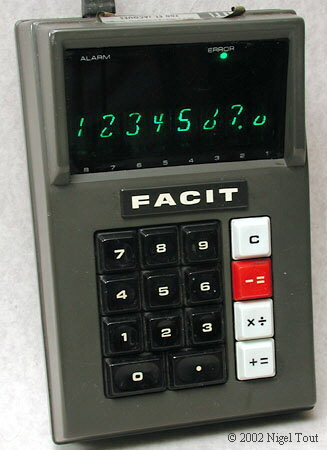 Note the strange shape of the numerals and the half-height zero clearly shown in the photograph of the Facit version below, distinctive of Japanese-made calculators of this time. The keyboard on this calculator has the number of keys reduced to the minimum by the use of only three function keys, including a combined "x÷" key. 4 x÷ 2 += gives the answer 8. 4 x÷ 2 -= gives the answer 2. This keyboard is further explained in the page about Calculator Keyboard Layouts. Main integrated circuits - Rockwell NRD2256, AC2261, DC2266B, AU2271B, CG1121. The four large-scale integrated circuits (LSI) are for the calculating functions, and the integrated circuit in the small can is the clock generator. This model was sometimes called the ELSI-8, where 'ELSI' stands for 'Extra Large-Scale Integrated'. 7.2v (6 x AA) re-chargeable battery giving three hours operation. 100 mm x 163 mm x 67 mm (4" x 6.5" x 2.7"). Was advertised in the U.S.A in early 1970. In June 1971 in the U.S.A. the cost was US$345 (about £145 GBP). The Sharp EL-8 was advertised as "operates on rechargeable battery or AC or battery (26 oz.)" whereas the Sharp EL-8A was advertised as "AC only (19 oz. )", so being a lot lighter appears not to have the rechargeable battery inside. The keyboard is notable for its use of only 15 keys. Multiplication and division are combined in one key, but the operation actually used is determined by whether the += key is pressed at the end of the calculation, to give multiplcation, or the –= key, to give division. There are video advertisements for the Sharp ELSI-8 on the YouTube site at http://www.youtube.com/watch?v=nCcgoTc8AQc and http://www.youtube.com/watch?v=uyaJ3YgtjWo. It is "the world's smallest electronic calculator". The rear cover has been removed, revealing the very neat and compact way in which the circuit boards and the rechargeable battery pack are arranged. After removing the top cover the "Itron" vacuum-fluorescent display tubes can be seen. The display board with 9 driver integrated circuits. The calculating board with 4 Rockwell LSI integrated circuits, a timer integrated circuit in the can, and a resistor array. This was one of the first hand-held calculators, but is just too big to be called a pocket calculator. The earlier Sharp model QT8-B was the first battery-portable model, but was really a desk calculator adapted with a battery module. Although it is hand holdable it is not really a pocket calculator due to its great thickness (67 mm / 2.7"). A version made for the Facit Company of Sweden. Although the case has a different design, the internal electronics are similar. 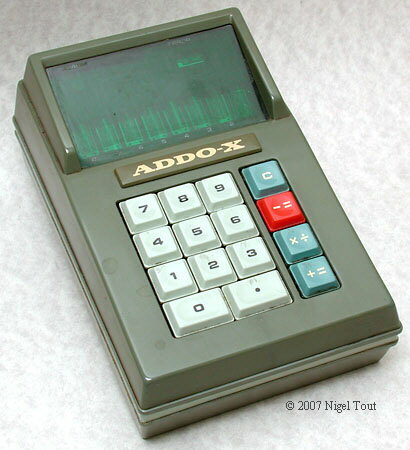 Note the stylised display used by many Japanese calculators of this time and the half-height zero. The display shows 1234567.0. A similar version to the Facit 1111 above. Addo was another Swedish company, and had links to Facit in the 1970s. The Sharp EL-8 was developed fron the QT-8B portable calculator and uses the same chip set. Limited battery power was the biggest problem faced by Sharp Corp. engineers when they were told to repackage the company's Micro-compet electronic desk calculator into a case with about half the volume of that formerly used. The new case has only enough room for six penlight-size rechargeable nickel cadmium cells, giving a total of 450 milliampere-hours compared with the 1,200 milliampere-hours available in the earlier model. Even the smaller cells are a tight fit: the, case measures 2.76 inches high by 4.02 inches wide by 6.46 inches long. Weight including cells is only 1.59 pounds. Redesign was quite successful—display drain was reduced to 460 milliwatts from 1,480 mW and logic circuit drain was reduced to 100 mW from 375 mW. As a bonus, the redesign eliminated the separate high-voltage power supply for the display. The redesigned calculator, called ELSI-8 around the Sharp plant, uses the same four large-scale-integration arrays made by North American Rockwell Electronics. These arrays feature a 4-phase logic scheme in which there is no steady-state dc power drain. Only the small current-1 to 2 mW—needed to charge the small gate capacitances of the driver transistors flows in the logic circuits. The lion's share of the power charged to the logic circuit is actually dissipated in the clock generator. The new clock generator reduces drain by three quarters and has better frequency stability. It consists of a static cross-coupled reset-set multivibrator circuit operating at twice the 50-kilohertz clock frequency, followed by logic circuits for generating the clock signals. An external resistor and an external capacitor set the frequency. The former arrangement was less stable because it used circuit resistance and stray capacitance. The double frequency arrangement cuts the number of logic inverters needed from 250 to 50. Display circuit power drain was reduced, and the need for a separate power supply eliminated, by a circuit change that at first glance appears to be a step backward. Instead of using the time division mode pioneered by Sharp several years ago, the new calculator drives each segment of each display tube separately in a static mode. The big virtue of time division is large reduction in driving circuits, but the big disadvantage is that the rapid switching dissipates large amounts of power in load resistors. Today, the saving in components is far less important than when the time division mode was adopted. In the new calculator, segment drive is by MOS FETs with nine driving circuits per package. Nine packages are sufficient to drive all eight digits and decimal points. Load resistors are completely eliminated because the display tubes segments serve as loads on the driving circuits. What's more, because the display tubes are operated in a static mode, the power supply voltage can be reduced from the 55 volts used in the time division mode to 25 V, the same voltage used for the logic circuits. With time division operation, a high supply voltage is needed for high instantaneous brightness to obtain high average brightness because of the short duty cycle." Rockwell collaborated with Sharp in developing calculator integrated circuits (ICs). A year or two later Rockwell produced its own range of calculators and sold the ICs to many other manufacturers. Nations Business, March 1970, pp58-59. "How to cut a pocket calculator in half", Electronics, Feb. 7 1971.